The minion had been showing an interest in super-heroes (as well he should), but finding affordable figures that are 1 year old friendly (i.e. : not too small, no little parts to come off and durable) and don't make my eyes want to bleed or make my classic comics sensibilities flare up in a full blown nerd-rage had been proving a challenge. Then he got into a cabinet where the cake toppers were from his first birthday, and that's when we knew he needed more. 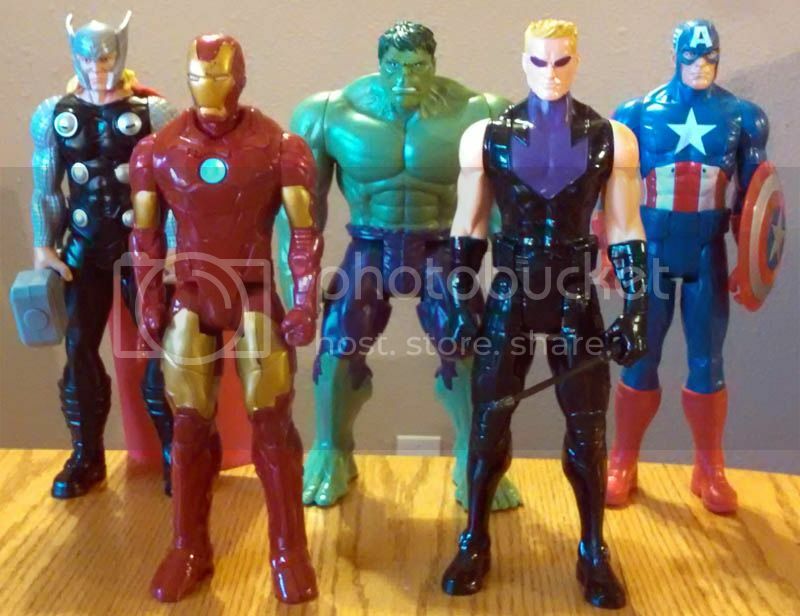 Then during Christmas shopping last season we stumbled on the Marvel Titan Hero series. A lucky little boy found himself the proud owner of Spider-Man, Iron Man, and Captain America (along with a couple from the last pic, below). Since then, it has grown into what you see here. I think he's finally matched or even exceeded my old collection in size (I'll have to photoshop an estimate of what it comprised of, having divested myself of them and my Star Wars collection prior to a move). Apologies for the quality of some of the pics. Trying to get them done quickly before a 2 year old wakes up (or is suddenly in the room) on a cell phone doesn't lend itself to taking re-shots. My biggest annoyance with this line (other than the inclusion of some questionable choices over/before the staples) is that on many of them the paint scheme is not continued on the back of the figure. 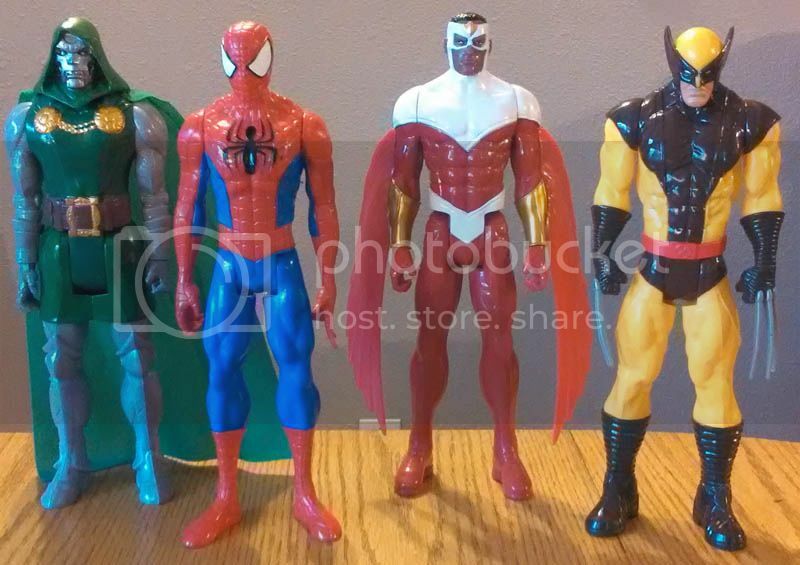 Spider-Man's back is completely red plastic, Cap's is completely blue, etc. I would really like to add Green Goblin and Spawn to the collection, but that would have meant having an extra Spider-Man and the new movie version of Electro. Nah. DC is much harder to find anything decent/acceptable for, which disappoints me greatly. Finally came across the Total Heroes line, which is fine for the most part. I would of course prefer the Superman to be the iconic rather than the new they're trying to force on everyone in almost every venue, but there are a couple more I've seen (not in person, or they would already be mine......er, I mean, his) that I plan on picking up. And I tried to get the power ring weapons into their hands, but that must be a one-time option, as there really isn't a big enough opening for them to fit into without fear of breaking something. The cake toppers are in the middle (Iron Man had a flying stand). Thor, unknown to me until just before picture time, recently lost an arm. I'm told that it's stashed away for later. 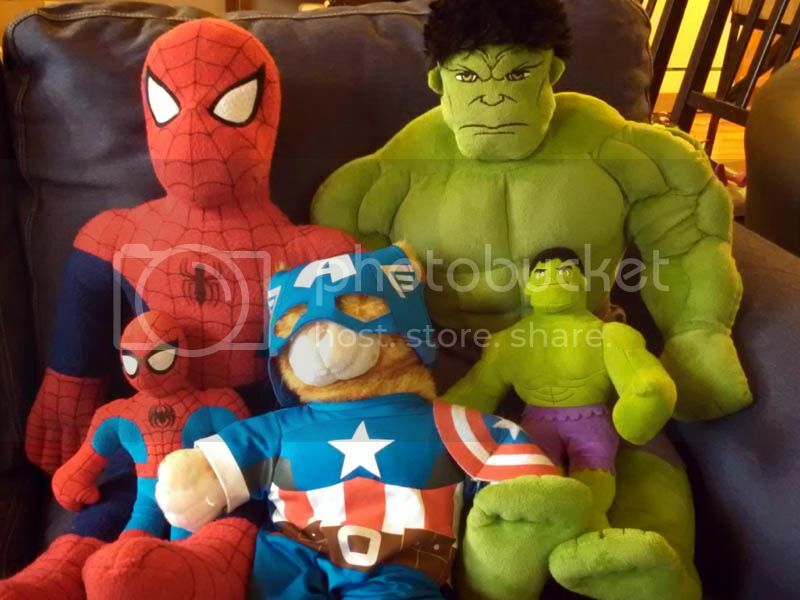 The two large ones and the small Spidey were also part of the first Christmas haul. At the time we knew he liked Spider-Man (having him on a few plates & such), but when he saw that big Hulk in the store, he wouldn't put it down. The little ones talk, and I got the little Hulk just because he says "Hulk Smash!" And I don't know why everyone winces when I talk about Cat-ain America (or would Captain Abearica have been worse). I tried so hard to get into Total Heroes after DCUC died, and even bought 3 of them before giving up. 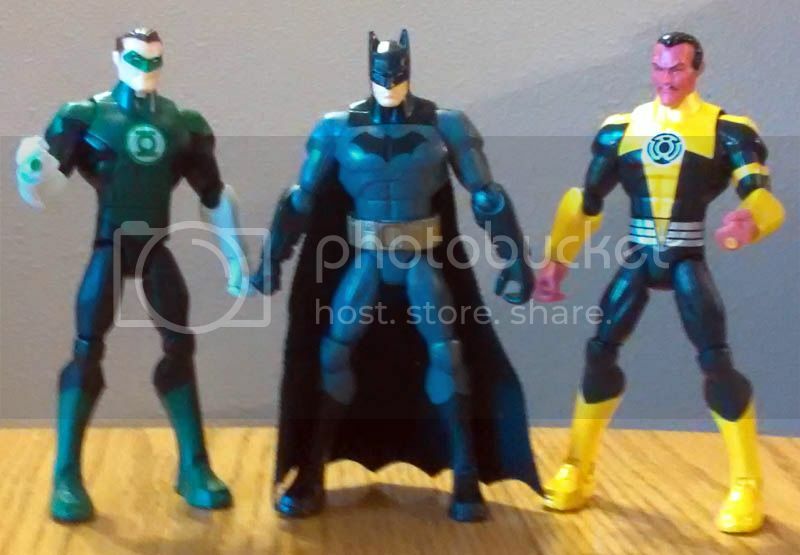 They're not bad toys, but I just didn't see the line lasting long enough to replace all the characters I already had with DCUC. Still, they work great for kids, and my brother really loves them. Once he gets a bit older though, definitely look into the playschool-type figures. They're a bit cutesy, but they come with so many different playsets and characters that they easily blow other modern toy lines out of the water.